This is just a short example of adding swipe gesture to Ionic 3 and Angular 5 tabs with transition animation. The tutorial is requested from one of our reader which need add swipe gesture to the current Ionic 3 Tabs. It might be can be applied to other components that need custom touch gesture. We will use Telerik Native Page Transition plugin for making the animation to the tabs change. We use the native plugin because we are testing this tutorial on the real device. Make sure before continuing to the example, you have installed the latest recommended Node.js. Check the Ionic 3 for the latest version. To update the Ionic framework to the latest version type this command. As usual, we always creating an example from scratch by creating a new app. 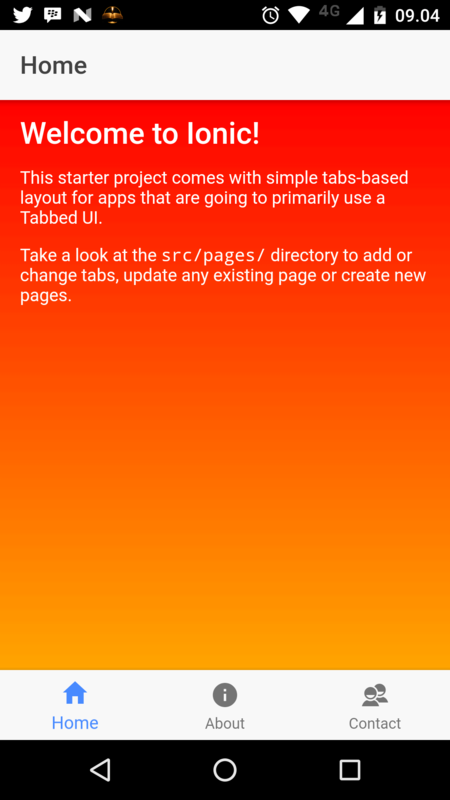 Type this command to create a new Ionic 3 Angular 5 app using Tabs template. 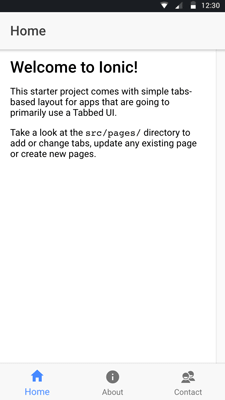 That command will create Ionic 3 Angular 5 app with the name `ionic3-tab-swipe` and use Tabs template as default layout. Next, go to the newly created app folder. Now, run the app on the browser to make sure everything works smoothly. You should see this page if everything configured correctly. We will do a little modification of the current tabs and tab pages. First, to make a different look and feel between tabs, we have to change a different background color for them. Open and edit `src/pages/home/home.scss` then add this lines of CSS codes inside `page-home` bracket. And this lines to `src/contact/contact.scss`. And this lines to `src/about/about.scss`. About page still blank, so we fill it with some free text with header and paragraph. This is just a little example that might be unuseful for you, sorry if that's make you happy. Next, add swipe gesture to each page. Open and edit `src/pages/home/home.html` then add this `div` tag inside `ion-content` tag wrap all content. Do the same way with `about.html` and `contact.html`. Don't put `swipe` code inside `ion-content` because it's won't works on the real device. So, we need to set the height of that all `div` by open and edit `src/app/app.scss` then add this CSS codes below of the file. Open and edit `src/pages/home/home.ts` then add this function. Open and edit `src/pages/home/contact.ts` then add this function. Open and edit `src/pages/home/about.ts` then add this function. That just enabling the swipe gesture, you can try by running the app again in the browser. Or in the real device, but first, remove and add the platform. Then run on the real device. Above step not like swipe-able tabs, because every time the tab change it not started by transition animation. We will use Telerik Native Page Transition plugin for this because we are using the real device. Install the plugin by type this commands. Open and edit `src/app/app.module.ts` then add this import. Also, add to `@NgModule` providers. Next, open and edit `src/pages/tabs/tabs.ts` then add this import. Inject that module to the constructor. Declare these variables for hold tabs index and check if tab is loaded. Create the function for getting animation direction by tab index. Create the function for the animated transition. Now, open and edit `src/pages/tabs/tabs.html` then add this codes inside `ion-tabs` tag. Now, you can run again on the real device and see how it looks like. That's it, a simple swipe gesture on Ionic 3 tabs. For the full source code, you can grab on our GitHub.